Welcome to the Department of Exercise and Sport Science at Oklahoma City University. Exercise Sport Science is a major with a broad application. It prepares students for several careers and educational endeavors, including Pre-Physical Therapy, Pre-Occupational Therapy, Pre-Athletic training, cardiac rehabilitation, personal training, strength and conditioning specialist, fitness and wellness management, sport nutrition, health promotion, several other related areas, and graduate school. The Department of Exercise Sport Science seeks to provide a quality learning environment to prepare students for a variety of careers in areas related to health, fitness, clinical, and corporate settings. We implement the knowledge, skills, and abilities in our students to provide the population a healthier lifestyle and a better way of living while providing outstanding field experiences and service-learning opportunities. 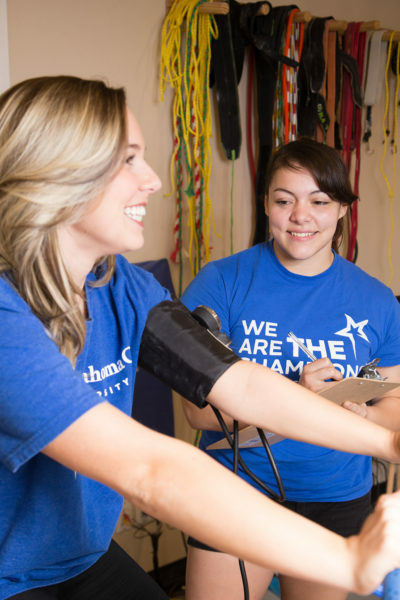 Learn more about the Exercise Science major here. Learn more about the Human Performance major here. Petree College of Arts & Sciences department of Exercise and Sport Science is offering two $6,000/yr scholarships for incoming Fall 2018 freshmen and transfer students. If selected, recipients will be required to participate in three days of training per week and compete in two big meets per year with the Weightlifting/Barbell Club. For more information on this scholarship or to learn more about OKCU's Weightlifting/Barbell Club, please contact Jason Miller at jmiller2@okcu.edu. Beginning Fall 2016, any student directly transferring from Rose State College into OCU's Exercise and Sport Science program with at least a 3.0 cumulative GPA may be eligible to receive a $2,500 Exercise Science scholarship, stackable with academic and departmental grid scholarships.For more information on this scholarship, please contact Jason Miller at jmiller2@okcu.edu.